An international team led by investigators in Sweden team used a series of array-based expression and methylomic profiling experiments to put together a so-called gene regulatory network for T cells differentiating into four T helper cell groups. NEW YORK (GenomeWeb) – The regulatory network controlling differentiation of the immune system’s T cells may contain markers of disease that differ in individuals’ blood samples even before symptoms appear, according to a new study in Science Translational Medicine. Mika Gustafsson1,2,*,†, Danuta R. Gawel1,†, Lars Alfredsson3, Sergio Baranzini4, Janne Björkander5, Robert Blomgran6, Sandra Hellberg7, Daniel Eklund8 , et al. Diseases may be easier to treat if caught early. However, means of identifying early disease—especially before symptoms appear—are in short supply. Now, Gustafsson et al.identify early regulators of T cell–mediated disease by finding transcription factors involved in T cell differentiation that are enriched in disease-associated polymorphisms. Three such experimentally validated transcription factors—GATA3, MAF, and MYB—and their targets were found to be differentially expressed in asymptomatic stages of two different T cell–mediated diseases—multiple sclerosis and seasonal allergic rhinitis. These data not only provide potential markers of disease development but also shed light on the mechanistic underpinning of T cell–mediated disease. By cross-referencing transcription factors from this analysis with information from past genome-wide association studies on common human diseases, the group narrowed in on three transcription factors showing disease-related differences in their expression, SNP profiles, and splice variant patterns. To test their hypothesis that the transcription factors might offer a window on symptom development, the researchers then tracked their expression in the blood of individuals with two relapsing diseases: multiple sclerosis and seasonal allergic rhinitis. Indeed, their results pointed to distinct expression profiles in those with or without symptoms, suggesting similar T-cell regulators could help in finding, treating, or perhaps preventing other common diseases down the road. “[We think] that different functional variants of these three transcription factors or their expression levels … can be used to predict many T cell-associated diseases with high accuracy,” senior author Mikael Benson, a physician researcher with Linköping University’s Centre for Individualized Medicine in Sweden, told GenomeWeb. For the most part, diseases aren’t successfully diagnosed until symptoms are obvious, creating problems for those tasked with trying to treat conditions that may already have caused irreparable damage, Benson noted. Along with suffering for patients, this treatment failure leads to health care costs associated with both ineffective drugs and new drug development. “Ideally, you should actually start treatment for preventing disease before symptoms occur, early in the disease process,” he explained. In their search for early blood markers of disease, Benson and his colleagues drew from their ongoing work on T cells — a group of white blood cells tasked with patrolling the body to find and stave off forms of disease ranging from metabolic conditions and heart disease to inflammatory conditions and cancer. “If you can tap into that information — what’s happening in those T cells — ideally you could diagnose disease processes early before symptoms occur,” Benson said. With that in mind, the researchers did array-based gene expression and methylation profiling on T cells over time as they differentiated into four subsets of T helper cells, hoping to find regulators relevant to early-stage disease. After assessing such in vitro T-cell differentiation events at six time points in four replicate experiments, the researchers plugged their data into a mathematical model designed by first author Mika Gustafsson, also at Linköping University, to tease apart factors involved in T-cell differentiation regulation. And from the set of transcription factors pinned to T cell differentiation, the team narrowed in further by folding in information on the genes and variants implicated in common human diseases through past GWAS. The search led to three transcription factors — GATA3, MYB, and MAF — that were confirmed as T-cell regulators through the researchers’ subsequent chromatin immunoprecipitation sequencing, gene expression profiling, and gene knockdown experiments in differentiated T helper 1 and T helper 3 cells. From publicly available gene expression data, the researchers found that these three transcription factors and/or their target genes were differentially expressed in T cell-associated diseases such as rheumatoid arthritis, acute myeloid leukemia, or systemic lupus erythematosus. Meanwhile, their own experiments in T cell samples from individuals with seasonal allergic rhinitis, individuals with MS, and unaffected control individuals suggested splicing patterns and gene expression of the three transcription factor markers shifted as symptoms appear in each of the relapsing diseases. While there may not be a clear clinical need to test for allergic seasonal rhinitis, Benson explained, he and his colleagues believe a similar approach could be used for finding informative markers in individuals at risk of certain diseases such as hereditary breast cancer, for example, to diagnose, treat, or attempt to prevent disease. More generally, Benson said, it would be ideal to start testing markers identified through these sorts of studies over decades in prospective studies of thousands or hundreds of thousands of individuals who start out healthy, using longitudinal blood samples such as those planned for President Obama’s Precision Medicine Initiative. Seems odd to me that they had done microarray as T cell differentiate. I would have felt this has been done with other methodology such as differential display. The finding of GATA3 does not seem unique though as this factor is commonly differenctially expressed as cells differentiate and is involved in the differentiation of many cell types. It only seems to me coincidental that a cross search in expression databases revealed GATA involved in disease states, which it is however does not seem a fair comparison. They would need to constitutively express GATA3 in an autologous transfer to see if mice develop symtomology of these diseases, which does not seem totally plausible. 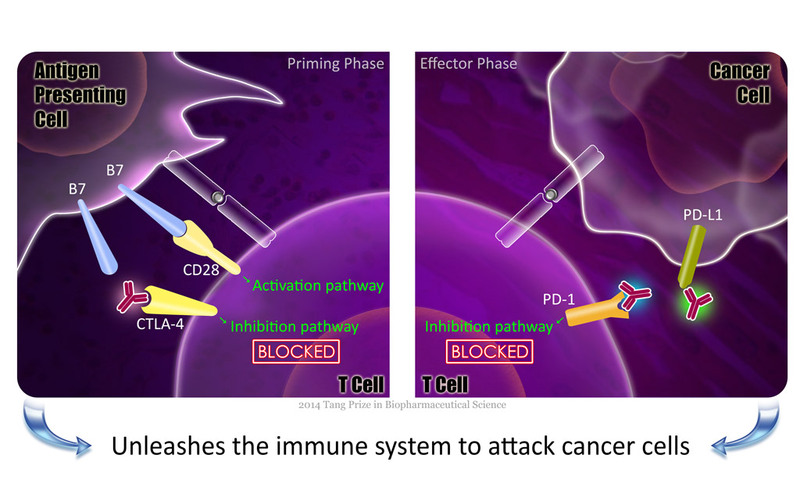 2014 Tang Prize in Biopharmaceutical Sciences awards to James P. Allison and Tasuku Honjo For the discoveries of CTLA-4 and PD-1 as immune inhibitory molecules that led to their applications in cancer immunotherapy 2014/06/19. Founded by Dr. Samuel Yin in December 2012, the Tang Prize recognizes scholars conducting revolutionary research in the four major fields of Sustainable Development, Biopharmaceutical Science, Sinology, and the Rule of Law. The Prize is awarded with each category a cash reward of over US$1 million (NT$50 million). The Tang Prize Foundation hopes that recipients of the Prize will continue to innovate while cultivating and nurturing new talent in their respective fields. Academia Sinica was commissioned by the Tang-Prize Foundation to administer the selection of Tang-Prize Laureates for the category of Biopharmaceutical Science, recognizing original biopharmaceutical or biomedical research that has led to significant advances towards preventing, diagnosing and/or treating major human diseases to improve human health. James P. Allison and Tasuku Honjo were chosen among nearly a hundred nominees for their discoveries of CTLA-4 and PD-1 as immune inhibitory molecules, revealing ways to harness our incredibly powerful immune system to fight cancer and marking the beginning of the immunotherapy revolution. A critical process in the immune response involves presentation of antigens to T cells by antigen-presenting cells, two key cell types in our immune system. This process is highly regulated by molecules that stimulate the response to ensure our mounting a sufficient immune response, especially in the event of invasion by pathogens, but also by molecules that inhibit the process to ensure the response is not excessive. Indeed, there is now a family of proteins on T cells involved in this regulatory process, which is designated the “CD28 receptor family” co-receptors, as CD28 is the first protein identified to have such function. They are divided into co-receptors transmitting stimulatory signals and co-receptors transmitting inhibitory signals. Each of these has its counterpart (ligand) on antigen-presenting cells belonging to the “B7 family”. Two most prominent inhibitory receptors on T cells are called CTLA-4 (cytotoxic T lymphocyte antigen-4, as it is first identified on cytotoxic T lymphocytes) and PD-1 (program death-1, as it is first identified to be associated with a type of cell death process called programmed cell death). Their ligands are designated as B7-1/B7-2 and PD-L1/PD-L2, respectively. These are also referred to as immune checkpoint receptors and ligands. Our immune system is not perfect and at times, the regulatory mechanisms might be faulty, which in fact may be the basis of a variety of diseases. For example, autoimmune diseases may be related to the suppressive mechanism becoming weak and the individuals can mount excessive immune responses even to their own cells and tissues. Also, our immune system is capable of recognizing cancer cells and attacking them, in a process called immune surveillance. However, cancer cells are also equipped with machineries to evade the host anti-tumor activity, which is described as immune escape. For example, cancer cells can also express B7 family ligands on their surfaces and, by engaging the co-receptors transmitting inhibitory signals on T cells, they can inhibit the host anti-tumor T cell activity. By recognizing how cancer cells escape the immune surveillance, scientists have developed novel approaches to interfere with the ability of cancer cells to suppress the immune response, thus enhancing the ability of the host immune system to inhibit cancer cell growth. Dr. James Allison, Chairman, Department of Immunology and Executive Director, Immunotherapy Platform at the University of Texas, MD Anderson Cancer Center, is one of two scientist to identify CTLA-4 as an inhibitory receptor on T-cells in 1995 and was the first to recognize it as a potential target for cancer therapy. His team then developed an antibody that blocks CTLA-4 activity and showed in 1996 that this antibody is able to help reject several different types of tumors in mouse models. This subsequently led to development of a monoclonal antibody drug, which has undergone clinical trials against stage 4 melanoma and been approved for treatment of melanoma by the U.S. FDA in 2011. Dr. Tasuku Honjo, Professor, Department of Immunology and Genomic Medicine, Kyoto University, discovered PD-1 in 1992. His group subsequently established that PD-1 is an inhibitor regulator of the T cell response. Additional studies from his and other laboratories established that this protein plays a critical role in the regulation of tumor immunity and stimulated many groups to generate its blocker for the treatment of cancer. Antibodies against PD-1 have been approved by the U.S. FDA as an investigational new drug and developed for the treatment of cancer. One such antibody produced complete or partial responses in non-small-cell lung cancer, melanoma, and renal-cell cancer in clinical trials, and is predicted to be launched in 2015 for treatment of non-small cell lung cancer; this has been stated by some as having the potential to “change the landscape” of the treatment for lung cancer. Another antibody, shown to achieve a substantial response rate also in patients with non-small cell lung cancer, is currently in clinical trial for many types of cancers. In addition, combination therapy (anti-CTLA-4 plus anti-PD-1) has been shown to dramatically improve the long-term survival rates in cancer patients. Dr. Yin read history at Chinese Culture University. He received a master’s degree in business administration at National Taiwan University and a doctorate in business administration at National Chengchi University. In addition to his academic background in the humanities and business administration, Dr. Yin’s great interest in and devotion to interdisciplinary studies have made him an award-winning civil engineer and educator. In 2004, Dr. Yin was named fellow of the Chinese Institute of Civil and Hydraulic Engineering. In 2008, he was invited to join Russia’s International Academy of Engineering and also awarded the Engineering Prowess Medal, the academy’s highest honour. In 2010, Dr. Yin received the Henry L. Michel Award for Industry Advancement of Research by the prestigious American Society of Civil Engineers (ASCE) for his contribution in the area of construction technology research. He was the first person without an academic background in engineering to receive the award. Driven by a firm belief that he should give back to the society that has enabled him to achieve so much, Dr. Yin has been investing in philanthropy and education for a long time, in the hope of creating a positive force in society and making a better world. Dr. Yin’s biggest dream was to set up an international award. He has long had great respect and admiration for the Nobel Prize, so he established an award modeled on the Nobel. The Tang Prize rewards excellent research in the areas of Sustainable Development, Biopharmaceutical Science, Sinology (excluding literary works), and Rule of Law. Dr. Yin hopes to encourage experts to dedicate themselves to innovative research in these fields and to spur human development with first-class research. Dr. Yin’s relentless enthusiasm for philanthropy was instilled through his upbringing, particularly the example set by his late father Yin Shu-Tien. Dr. Yin established a foundation in memory of his grandfather, Yin Xun-Ruo, to provide scholarships to students of families originating in Shandong Province to study Chinese literature and history. When Yin senior passed away, Dr. Yin also set up the Kwang-Hua Education Foundation to help with China’s higher education programs. In the past few years, Dr. Yin has set up a number of foundations to serve people on both sides of the Taiwan Strait and to foster more talented people for the nation (the Yin Xun-Ruo Educational Foundation, the Yin Shu-Tien Medical Foundation, the Kwang-Hua Education Foundation, and the Guanghua School of Management of Peking University). In 2012, Dr. Yin set up a global award, the Tang Prize, to spread his philanthropy across the world.